From the comfort of self catering holiday accommodation discover the Blackdown Hills, an Area of Outstanding Natural Beauty, with its many sources of local foods, opportunities to bird watch and good walking. Explore the nearby market town of Honiton, renown for lace and antiques, the World Heritage Site Jurassic Coast, Exeter and National Trust properties easily reached from Twistgates Farm Cottages (sleep 2/3, 4 & 5, + 2 in Orchard Bedroom) and the Apple Loft apartment, an ideal honeymoon or romantic break destination for a couple. Short breaks available all year including Christmas and New Year. 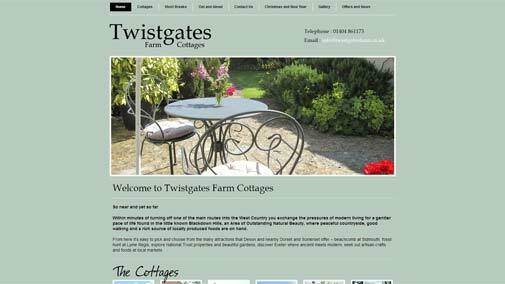 Twistgates Farm Cottages required a website theme which fits the fact that they specialise in farm house cottages in the countryside, so using a mixture of greens along with images showcasing the accommodation and landscape fits this well.